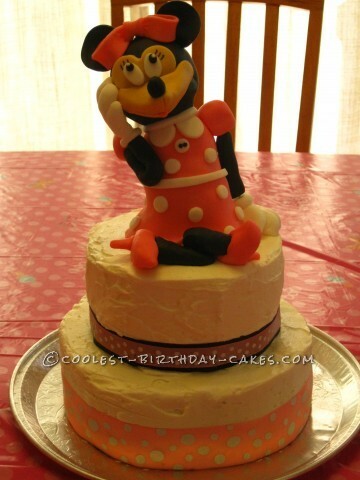 Who wouldn’t like a Minnie Mouse birthday cake for their 2nd birthday? The recipient of this cake was over the moon! She is a girly girl and this mouse needed to rock a pink dress. I made Minnie completely out of fondant covered in rice krispie squares that were molded into shape. It took several days to add things to her so they had time to dry. I placed her on the top using a dowel that was placed all the way into the cake to support her weight. I used royal icing to secure her to the dowel. I carefully steamed the fondant figure so it had a nice shine to it. I wrapped two different colored ribbons around the cake to give it a finishing touch. Brooklyn was so pleased with her cake!